Save up to $552.00 per couple at Secrets Papagayo in Costa Rica! 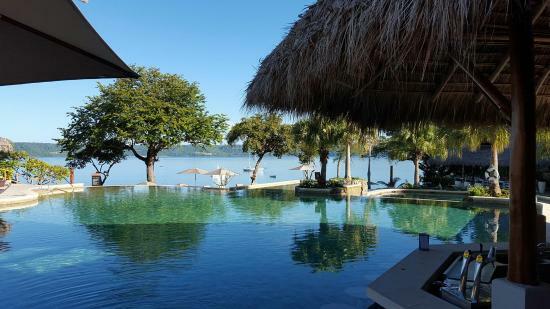 Secrets Papagayo Costa Rica sits on a black, volcanic sand beach, which when coupled with lush, mountainous surroundings provides a stunning backdrop for an intimate, relaxing and romantic getaway. A short 20 minute drive from the Liberia International Airport, this adults-only resort will seem a million miles away. Perfectly situated on a serene beachfront and surrounded by lush tropical gardens, this hideaway will offer an Unlimited Luxury experience in one of the most romantic and intimate settings imaginable. Enjoy free Wi-Fi and free international calling to the US, Canada and Mexico with Unlimited Connectivity. The mobile app also allows you to view the schedules of all events, activities and restaurants at the resort, plus to learn about local destinations, excursions, and much more. This adults only paradise would make a great getaway! Contact one of our Upon A Star Travel Experts today here!